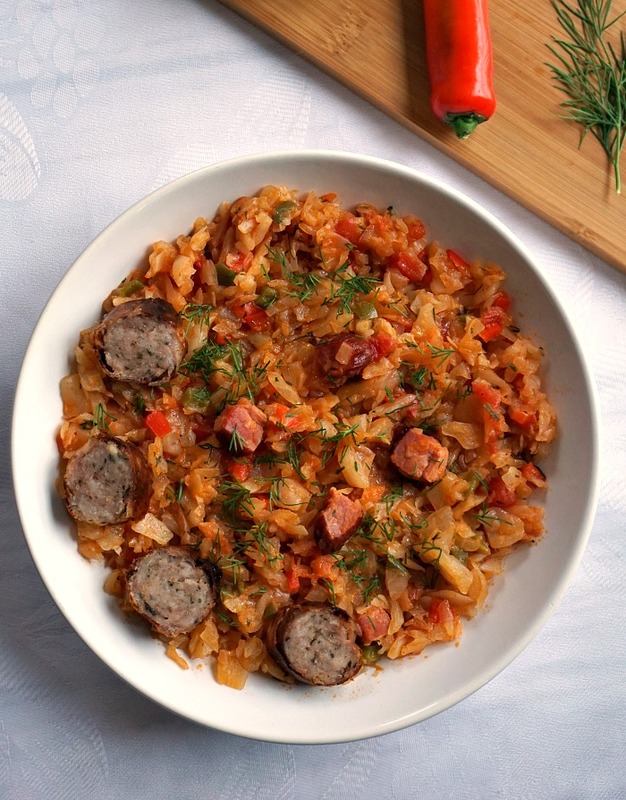 Braised Cabbage with ham and sausages, a traditional Romanian dish and definitely one of the tastiest too. My kind of comfort food, no matter the season. It might not sound too interesting, but once you had some, there is no going back, you’ll find yourself cooking this braised cabbage recipe again and again. Best served with chilli pepper and polenta. 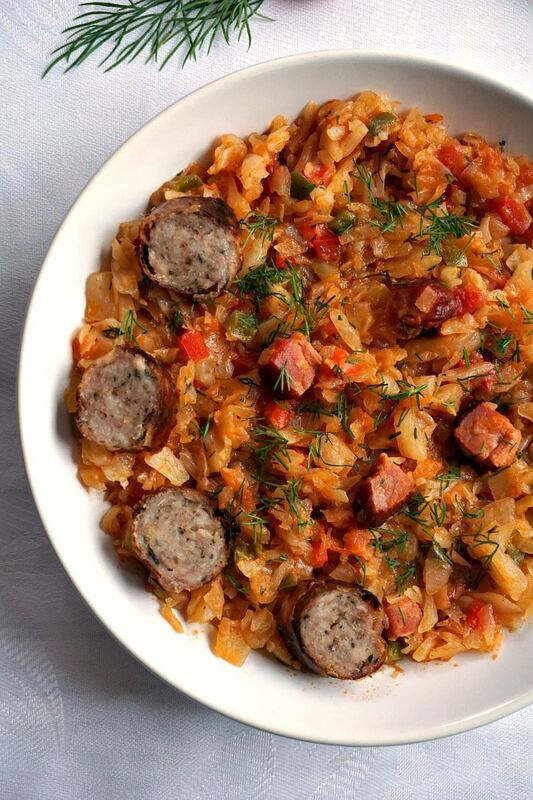 Romanians love cabbage, either fresh, as a nice salad with vinegar and oil, braised, with or without meat, or pickled – sauerkraut, which is usually used to make our national dish Romanian cabbage rolls with rice and meat, usually pork, but chicken or beef are also common. 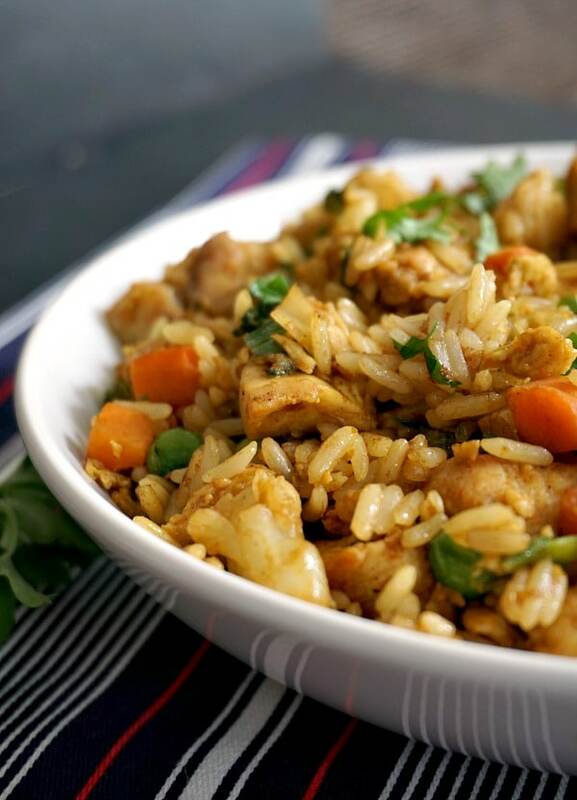 My Cabbage rolls with chicken and rice is a recipe l am very fond of, and make very often. 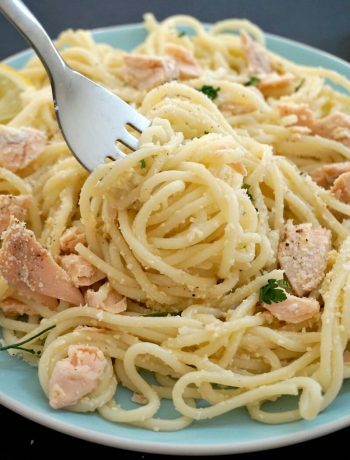 Nothing like a comforting dish to remind me of home. Cabbage loves dill and bay leaves, you could cook it without, but you won’t get the full flavour and won’t appreciate the real taste. This dish turns out to be really cheap, from one medium cabbage you can easily feed 2 or 3 people. Shredding cabbage might not be a pleasant task, or, at least l find it boring, but the result is just delicious. Once the whole cabbage is shredded, you might think it’s too much and won’t go in the pan, that is why it has go in the pan in batches, because once it softens a bit, you realise it’s not that much after all. And that’s because cabbage releases quite a lot of water when cooking. Pretty much like cooking mushrooms actually. Another tip is to rub it with some salt before adding it to the pan, it will cooked faster and it will definitely taste better. Be generous with the tomato paste, it brings the whole dish to the very next level. Smoked ham is ideal for this braised cabbage dish, it gives that unique smokey flavour, and some good pork sausages with a tiny bit of fat for some extra flavour, although you can use any other kind of sausages, even vegetarian ones. 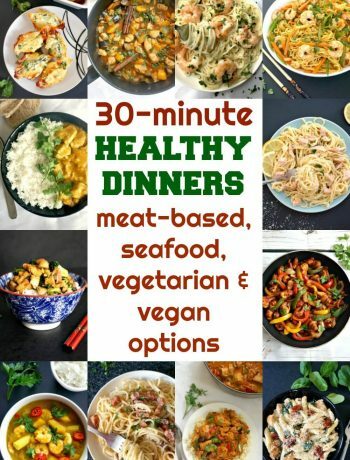 Or just omit meat altogether for a vegetarian/vegan version, it will still be lovely. I really love this dish, it takes me straight back home where l had the best childhood and the best food. You can’t be a child again, but you can certainly taste the same awesome food. And that without spending a fortune. Isn’t that amazing? If you’ve liked my BRAISED CABBAGE RECIPE or any other recipe on the blog then don’t forget to rate the recipe and let me know how you got on in the comments below, I love hearing from you! You can also FOLLOW ME on FACEBOOK, and PINTEREST to see more delicious food and what I’m getting up to. 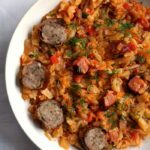 Braised cabbage recipe with ham and sausages, a traditional Romanian dish that is tasty and full of flavour. Best served with chilli and polenta. Shred the cabbage, sprinkle salt over it and rub it with your hands. Set aside for 10 minutes. Meantime, heat up the oil in a large pan, fry the sausages until throughly cooked, then remove from the pan. Chop the onion and pepper and add them to the same pan, frying for 5 minutes until soft. Add the cabbage to the pan in batches, as soon as the first batch softens and allows for more cabbage to be added to the pan, in goes the second batch together with the bay leaves. Keep stiring with a wooden spoon, when the cabbage has released its liquid, cover it with water and leave to cook on a medium heat until very tender. Season with more salt if needed, add the black pepper, tomato paste, sliced sausages, smoked ham and dill and cook for a further 5 minutes. Serve hot with polenta and chilli pepper.